Super Savings Item! 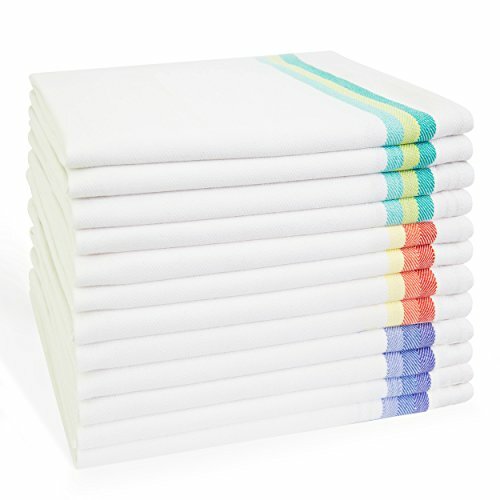 Save 39% on the Kitchen Dish Towels set of 12-Tea Towels by Harringdons, 100% cotton. LARGE Dish Cloths 28''x20'' soft and absorbent. White with blue, green and red stripes, 4 of each. There's no substitute for QUALITY by Harringdons at Foom App. Hurry! Limited time offer. Offer valid only while supplies last. The Best Kitchen Dish Towels for you and your kitchen. Add warmth and beauty to your kitchen now. Are your dish towels too small and falling apart? - Comes in a pack of 12 with three lovely colors: blue, green and red, 4 of each in a pack. Dish towels that are Eco-friendly. The green alternative to paper towels. Made with sustainable, environment friendly cotton for daily use. Machine washable and lint free - Commercial grade hemming prevents unraveling after multiple washes. World class quality suitable for hotels and homes. Multiple Usage - Use for drying, wrapping bread, cleaning spills or put it in your picnic hamper. Great for embroidery and crafts. Makes a lovely gift for a loved one. Add color to your kitchen - enjoy THREE different tones of color in one set. Each towel comes with a corner hanging loop.